At the time of establishing the Sabha this was a totally neglected area where the population consisted mostly of people belonging to the Ezhava community which was at that time considered to be a part of the untouchables. These downtrodden groups were socially suppressed by the upper castes that denied them the rights to worship in temples, study in schools or even use the public roads. Some youngsters of the area belonging to this community decided to unite and fight against such social taboos. It was at this time that they came across Brahmasri Ashtavadhani Parisudha Visishta Paranatha Khandana Venkatagiri Sastrikal – an Andhrite theologist who was linked with Hindu Matha Parishkara Movement. Sasthrikal offered the main source of guidance & support in the setting up of the Sabha. Thus as the fruit of intense dedication and effort put forth by this group of Ezhava youth of Moothakunnam, Kottuvallikad and Maliankara on 08-06-1882 the Hindu Matha Dharma Paripalana Sabha came into existence with Sasthrikal as the President. During the first two months 152 members were enrolled. It was made compulsory that a minimum of one membership was to be taken from every Ezhava family of the locality. For further growth, the membership was allotted to people from Chettikkad, Madaplathurth and Vavakkad and to other areas like that of Vadakkekara Village. Madathil Ittiyathi Unikoran, Poomalil Raman Raman, Thaikoottathil Raman Ekkannan, Tharayil Kandan Raman and Tharayil Krishnan Kandan Kumaran constituted the Executive committee and Erezhath Untaman Krishnan was the Secretary. The current membership of the Sabha is 695. As mentioned earlier the late 19th century was a period which socially oppressed the Ezhava community. The Sabha was established with the aim of struggling against this injustice and for providing the basic human rights to the natives of the locality. The first winning step was made by promoting the temples of the locality. People from in and around the area and also from far off places visited the two temples – one of lord Siva and the other of Bhagavathy. Major Social events like marriages were held under the direction of the Sabha with the co-operation of the local bodies which till the period directed these functions. The meetings of the Sabha were held in the temple premises and thus the local people were attracted not to the temple activities alone but were attracted to the social developments contributed by the Sabha too. It is the same factor that made Sabha rise into a commanding position in the society. The decisions made by the Sabha in the social events were respected and accepted by the local people. Side by side the Sabha gave importance to the activities of the temple and during the Malayalam Era 1070 the land for the SNM temple was acquired and the process of renovation started. Brahmasri Sree Narayana Gurudevan, –‘The Saintly Guru of Kerala’ visited this place in 1895 and strove hard for the upliftment and reformation of marginal section of our society. His name was christened and he established ‘Prathishta’ in 1903 at Moothakunnam Sreenarayana Mangalam Temple. The Malayalam Era 1078 witnessed a memorable event in the history of HMDP Sabha.On the 20th day of ‘Makaram’ Bhramasree Narayana Guruswami consecrated the Idol of Sankara Narayana at the Sree Narayana Mangalam Temple. The events marked the beginning of the Glorious years of social and economic growth which has been, as the Sabha believes, endowed upon them by the blessing of Sree Narayana Guru Swami himself. The great Guru has been very liberal in providing guidance from time to time and has visited the temple and the Sabha and has shared his valuable knowledge which was instrumental in building an effective policy for the upliftment of the local society. A meeting was convened by the Sabha for the Ezhavas of Vadakkekara and nearby places which was presided by Sree Narayana Guru Swami. In this meeting the Guru conveyed the message that there is the need to abolish social evils that existed in the society. There he called upon the people to restrict the flamboyance and expenditure of functions like marriage etc. His words were duly accepted and treated as commandments in the community. 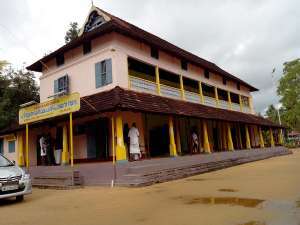 Sabha gave financial help into the building of Aruvippuram Kshethram and also paid tribute to the Guru by gifting 90 cents of land and a rest house at Aluva.This is presently used by the SNDP High School. The Sabha has also extended financial assistance at the time of purchase of land for Advathashramam, Aluva.